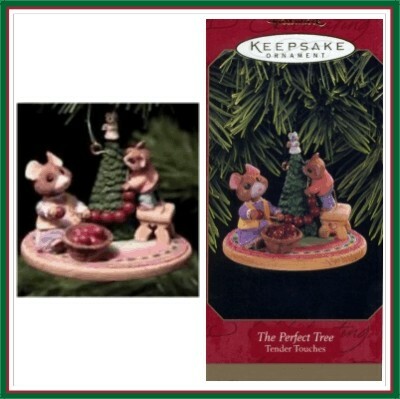 Created to commemorate the 1997 Keepsake Ornament Premier event, this highly detailed design reflects the special joy of decorating "The Perfect Tree." This whimsical portrayal of a favorite holiday tradition is a happy reminder that -- 'tis the season to share the fun! The bottom of the ornament is marked, "Tender Touches, Keepsake Ornament Premiere (C) 1997 Hallmark Cards, Inc."
The ornament can be hung on your tree or displayed on a table. MIB with normal aging. Has Price Tag. Never displayed.